I didn't move to Maine in mid-1991 to take a job in which the art director of Time Magazine would call me up and scream impotently at me, but then we never know how life will play out, do we? Once upon a time, Kodak built a teaching center for creative artists and professionals in mid-Coast Maine, one of the most beautiful places in the country. People came to take classes to help them navigate the rough transition between analog media and new digital tools, like photography. My job was to keep 100 Macs and all the peripherals running and help design courses that served thousands of students a year. We also invited up well-known professionals for special, lavish events. One of them was a regular Time Man of the Year cover photographer, Greg Heisler. It's hard to recall now but Time and the defunct Newsweek were respected publications in the early 1990s, closer to The New York Times and The Economist, before they moved towards being like People without People's integrity and reporting skills. Time's Man of the Year was a press event in itself that made piles of money for Time with extra issues sold. Greg was an incredibly nice guy, and we loved him in part for his devastating shot of George H.W. Bush that had graced the January 1991 Men of the Year cover. Called "The Two George Bushes," Greg had arranged the shot meticulously "in camera" as two exposures with no digital work involved, to show Bush as a stinking liar. The White House was not pleased, and Marlin Fitzwater banned him from the press pool temporarily. 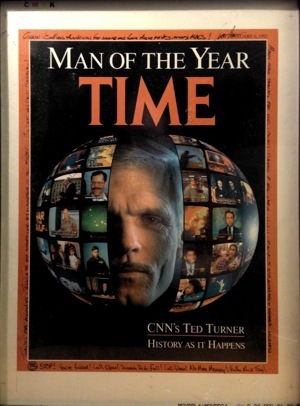 The 1992 Man of the Year was Ted Turner, and Greg asked (and our director agreed) to come to the center and spend days, which turned into weeks, producing a digital cover of Ted and hundreds of video frames grabbed from news events covered by CNN, such as the Gulf War. These frames were made as photographic slides—that was state of the art in 1991, thank you very much. Several days in, Time's art director, who I will call "Bill," flew up from Manhattan to check on progress. He arrives in Camden, Maine, decked out head to toe in newly purchased L.L. Bean gear. I'm surprised price tags weren't still attached. He was a birder. He was delighted to visit and add to his life list. He took the three of us to dinner, which came to the whopping price of $80, and he paid with a $100 bill. Fancy. Seemed a nice guy. Was appreciative of us pushing the envelope. He flew back and started drumming his fingers on his desk awaiting the photo's completion. While Greg and Jessica worked nearly round the clock at a more and more frantic pace, the deadline to get the digital composite ready for offset printing grew ever closer. Bill became more agitated, apparently. Drives filled, software and computers crashed, files corrupted. The very real possibility that we couldn't finish the work before it needed to be on press started to emerge. I called Greg, Greg apologized, Greg called Bill, Bill stopped freaking out. A few more days passed, many Persian buns were consumed, but, in the nick of time, the file was flown to New York (it would have taken days to transmit it by dial-up modem at 14,400 bits a second; yes, keep laughing, children), and the presses rolled! Greg was lionized for producing this digital masterpiece and rightly so. I think even Turner liked it. Days later a package arrived from Greg. It was a four-color proof of the cover signed by him with a thank-you note full of filthy plaudits tracing the entire border. I cherish it to this day. But I never heard from Bill again, who left Time not long thereafter. Not even an L.L. Bean gift certificate in apology.